In celebration of the many Amazon animals we know and love, we’ve collected some “fun facts” about some of our favorites. Enjoy! Did you know Black Spider Monkeys are so called because they hang from trees by holding onto branches with their limbs as well as their long tails, thus appearing like spiders? The spider monkey is one of the most primitive monkeys in the New World. A uniquely long, prehensile tail enhances agility and allows this monkey to climb tree branches quite easily. When different troops of spider monkeys meet, they hug each other to express greetings while generally avoiding confrontation and aggression. Spider monkeys use distinct sounds to communicate. They scream, sob, and even bark when they feel threatened. Spider monkeys can survive 22 to 25 years in the wild, and up to 35 years in captivity. Did you know that the Giant River Otter may reach up to six feet (1.8 meters) long? That’s more than twice as long as a North American river otter. The giant otter belongs to a family of carnivorous mammals called mustelid. They are very social creatures. Their busy days include grooming, hunting, resting, and communicating, which they do using nine different vocalizations, most of which are probably predator warnings or contact calls. Giant river otter cubs are born covered in fur; indeed, the species is one of the only carnivores with a fur-covered nose. Two or three weeks after a giant river otter is born, the mother puts the cub in the water to learn to swim. Within a month or two, this young otter becomes a proficient swimmer and can hunt with the rest of the family. They stay within the family group until around age 2.5 years, when they reach sexual maturity. Giant river otters live approximately 12 years in the wild and up to 21 years in captivity. As reported in our “Endangered Animals of the Amazon” post last week, giant river otters are endangered species in the Amazon. Did you know that the white-throated toucan is primarily an arboreal fruit-eater, but will also dine on insects, lizards, eggs, and small birds? The mating ritual is a fun-loving affair for toucans, as they throw fruit to one another. After the 18-day gestation period, toucan nestlings are born blind, with no trace of down on their pink skin. 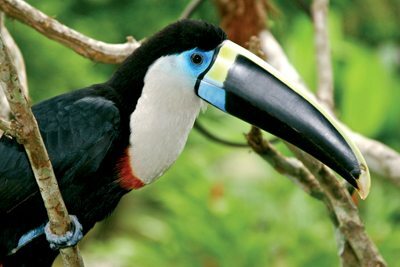 The bill is unremarkable until about 16 days old when it takes on the distinguishing features of the toucan, and requires up to four month to develop fully. Feathers begin to expand at 4 weeks. Babies have pads on their elbows that protect their feet by keeping them elevated until they fledge. The mature toucan’s bill however is not effective for digging or any other type of extensive excavation work, so they must rely on holes already formed by other means in their quest for food. Did you know spectacled caimans are capable of retaining enough energy from the sun in their bony neck’s natural solar panels that they can live without eating anything for a year? The basic spectacled caiman diet consists of snails, birds, frogs, bugs, fish, turtles and wee mammals. When spectacled caimans are ready to mate, their wooing activities are evident to anyone in the vicinity. These antics include pressing their snouts against each other, massaging their backs together, making deep roaring sounds, producing bubbles and repetitively moving around each other in circular motions. Spectacled caimans of both genders partake. This species’ reproductive season starts in April and ends in August each year. Spectacled caimans tend to undergo major changes in temperament between the reproductive season and the rest of the year. Outside of mating season they tend to be meek and timid animals. While mating, however, they are often very defensive and ready to attack.